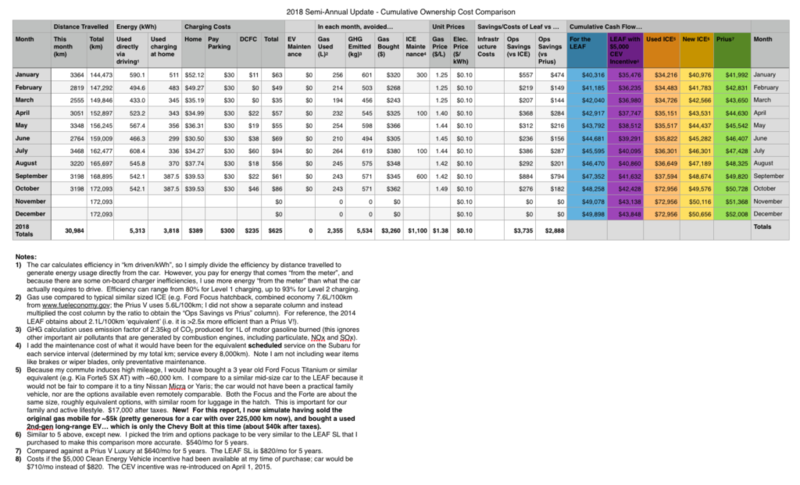 Welcome to another edition where we show all of the costs for our 2014 Nissan Leaf SL electric vehicle (EV) to-date, which is 4.5 years now. This post is one in a series, the rest of which can be found at Cost Info Posts. Note that all costs are in $CDN. 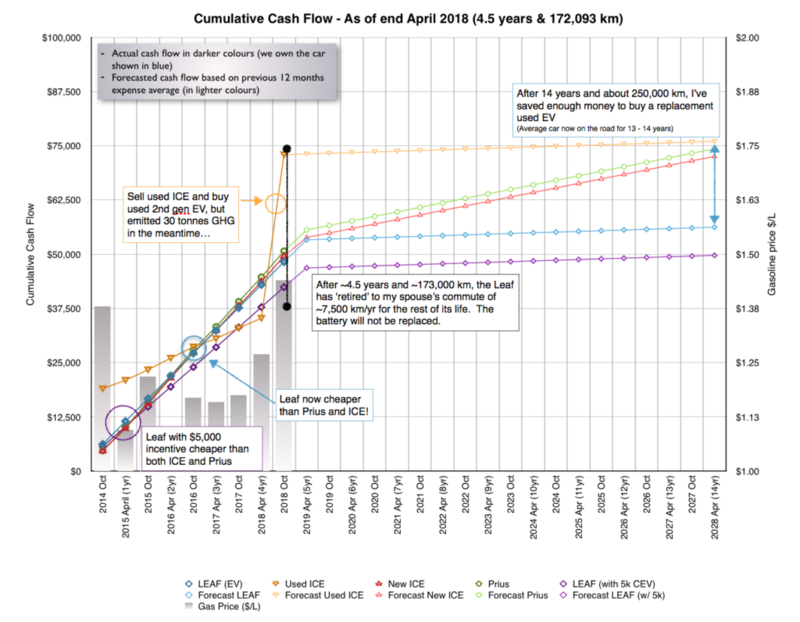 First off, the usual detailed 6 month interval update, then a look at the forecast costs for the Leaf into the future (this edition with new charts), and lastly a surprise! The biggest change was “selling” the gas car (“Used ICE” column in orange) and buying a used Chevrolet Bolt EV, which so far is still the only long-range used EV available on the market (or even affordable new one! Though not for long…) Used prices, when you can even find them, are in the high 30’s. As you can tell at a glance, that would have been the more expensive way to go about the whole process… even if I were satisfied by the idea of buying a very similar Leaf to what I have now, my total cost would have been about the same (within a few thousand, up or down depending on exact year Leaf and trim). The gas price did go up during this last period to an average of $1.44, the highest to-date, which increased the typical savings spread by ~$375. Crossing over the 100,000 mile mark (160,934) yielded the biggest scheduled service as well, at a whopping ~$600!! However, with the arrival of the Direct Current Fast Charging (DCFC) network, we have been making good use of it… spending about $225 in the last 6 months on about 65 charge sessions, which ate into our savings rate somewhat (now the question is, are those trips we would have done anyways with the fossil car, or are they new trips?) More to come on my DCFC insights from 2018 in a separate post! Flip back to the 4 year cost post for a moment and check out the two similar graphs, then come back. Ok you’re back! You’ll notice that the graph above looks the most similar to the second graph I presented 6 months ago… yes that’s right, the Nissan Leaf is going into retirement. Sort of. Following on point 1, even if I did replace the battery with the same capacity as the current one, I would still be needing to charge on Level 2 in the town I commute to, or use a fast charger twice per day at roughly the 2/3 and 1/3 point in the commute. This was cumbersome at the best of times without charging at work, and 8 months of the year we are engaged in after school/work activities that involve a decent amount of driving (to get to the nordic ski area and BMX track seasonally). My next commuter will be able to do the round-trip easily, with all the range to spare for eventual degradation, evening activities, and bad weather, probably for upwards of 15 – 20 years (i.e. the life of the car). Moving to a car that will do the round-trip saves me anywhere from 30 – 60 minutes of my day in walking to/from a charger and/or charging (especially in winter, when DCFC on a Leaf is S-L-O-W, more on that in a future post on DCFC). Time is one thing I can’t buy more of, and I’ve never been more acutely aware of that! Creature comforts – I spend 2 hours in the car each day, and the Leaf is decidedly cramped for a 6′ (182cm) guy (and there weren’t any other EVs to cross-shop it with at the time of purchase). It also does not have lumbar support, and my back is really noticing that. However, none of the above items matter for the city driving in and around Nelson thankfully! The Leaf is a great car for booting around town and has been incredibly reliable, so we expect it to give many years of service in this capacity. Maybe in another 10 – 15 years when the original battery finally gives out, there will be affordable aftermarket choices to replace it. 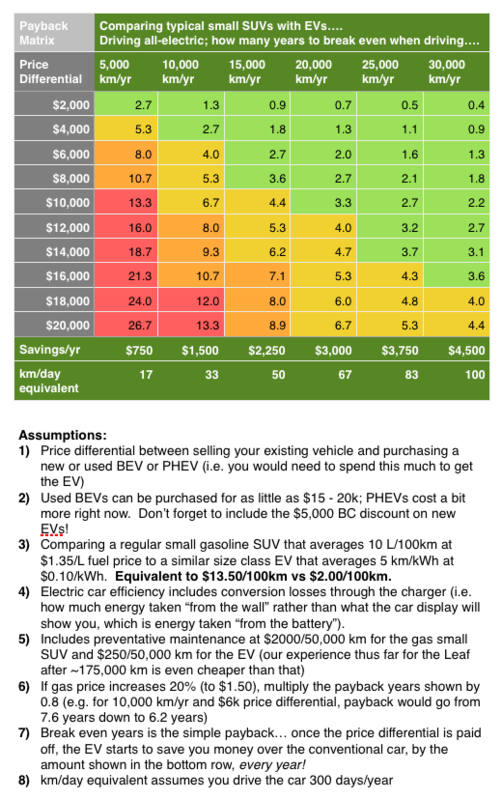 So with that in mind, the chart above has been updated to forecast the costs for in town trips as my spouse’s car. And guess what! Even with this transition, we’ll still be saving money over the other choices I had to make 4.5 years ago. 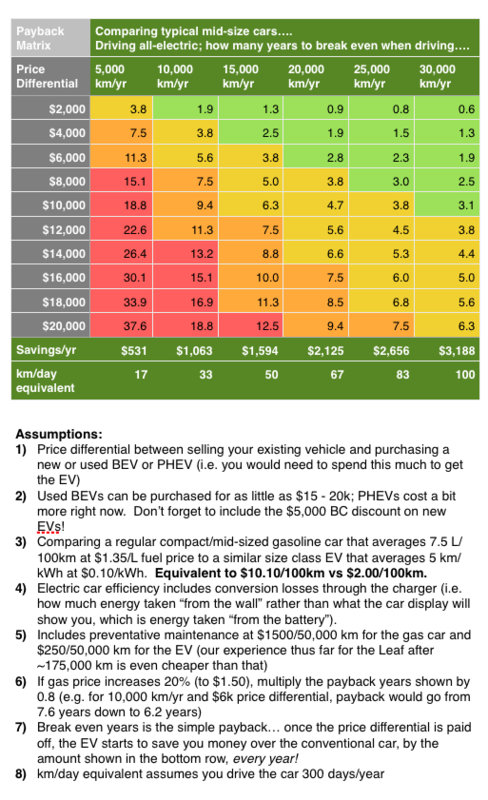 Selling your gas car/SUV/truck and trading straight across to a Nissan Leaf (or other similar cost used EV, see “Available EVs in Canada” for some other ideas). 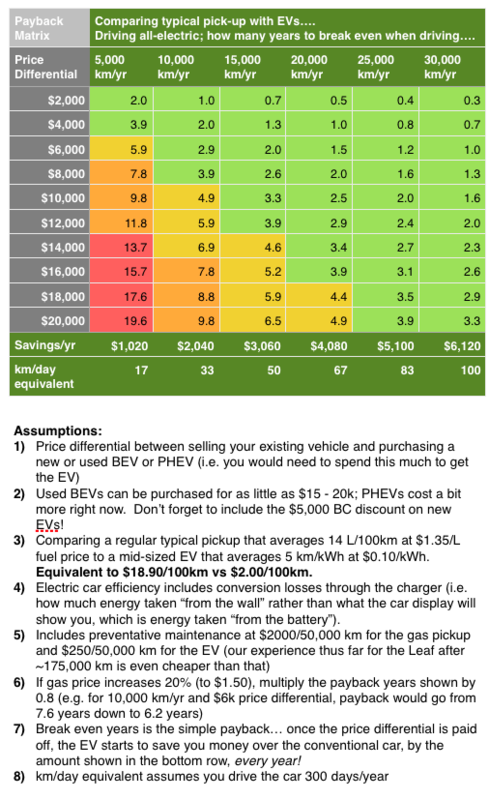 Selling your gas car and spending $2k more for an EV; or $4k more, $6k more, $10k more, or even $20k more! Take a look at how long it takes for you to recoup your cost outlay, and check out your future savings potential! There is one chart for replacing a typical car, another for replacing a mid-sized SUV, and another for replacing a pickup. Consider whether you truly need your AWD lifted SUV/truck – some of you legitimately do, others less so. I’ve been pleasantly surprised at what I’ve been able to do in my Leaf, and it has made me reconsider what I need in a vehicle (more in that future post on the next EV). Ok, no surprise that if you switch from a vehicle using more gas to an EV, that despite being in the same size class uses essentially the same amount of energy, you’ll get a payback quicker. Phew, that was a long post!! Next Next post: So what are we getting?